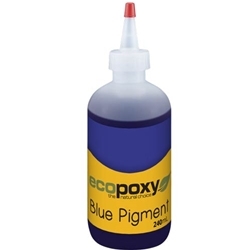 EcoPoxy epoxy concentrated pigment consist of pigments suspended in epoxy resin which allows them to blend thoroughly into epoxy resins to make very uniform colors. They are used to tint epoxy resins used as coatings, paints, gelcoats, laminating, casting or self-leveling resins. The high tinting properties enable the use of little quantities of pigment. The quantity to be used depends on the color chosen as some colors cover better than other (yellows for example need higher quantities than other colors).